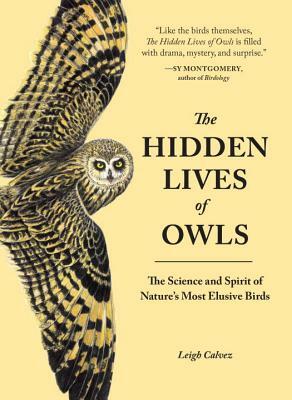 The Hidden Lives of Owls: The Science and Spirit of Nature's Most Elusive Birds (Paperback) | Eagle Harbor Book Co.
Leigh Calvez introduces readers to eleven different species of owls - animals she considers to be "in the world, but not of the world." Deeper than standard science writing, the book reflects upon the intersection between humans and threatened animals. Humans may be responsible for their loss of habitat, for example, but through citizen science we can also play a part in their survival. Anyone not already enthralled with these majestic birds will be after this thoughtful read. We may also do well to take some of Calvez's new-found owl wisdom to heart: "Take time to sit and observe," and "Be patient. Eventually something will move." In this New York Times bestseller that will appeal to readers of H is for Hawk, a naturalist probes the forest to comprehend the secret lives of owls. Join Leigh Calvez on adventures into the world of owls: owl-watching, avian science, and the deep forest—often in the dead of night. These birds are a bit mysterious, and that’s part of what makes them so fascinating. Calvez makes the science entertaining and accessible while exploring the questions about the human-animal connection, owl obsession, habitat, owl calls, social behavior, and mythology. Leigh Calvez is a scientist and nature writer and the author of Whale Watching on the West Coast. “Leigh Calvez shares what she calls her ‘owl journey’ in this beautiful book, which is full of sensitive observations and high drama. It’s a pleasure to see the world through an owl’s eyes, a point of view that Leigh herself believes has enlarged her life. Certainly this book does the same for ours." "Calvez’s The Hidden Life of Owls is particularly entertaining to read because she describes the adventures she has looking for and finding the owls… You will enjoy following Calvez’s adventures, as she begins to understand that the owls provide her with a way of “knowing something more” about her world than she has known before." "Entertaining and enlightening… a worthwhile and enjoyable read." "[Calvez's] writing integrates the luscious imagery of her surroundings along with the scientific data and analysis... it creates such an engaging reading experience." "This book intertwines the natural history of eleven owl species with Calvez’s personal experiences, adventures and often, close encounters."